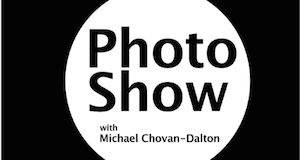 Photojournalists and their professional advocates come together for a wide-ranging discussion on the critical issues faced by photographers in the coverage of war and other conflicts. RSVP Here. Brooklyn-based artists Anne Arden McDonald, Alice Quaresma, and Blond Jenny open their studios for a view into experimental approaches to photography. Michael Chovan-Dalton and the apexart staff discuss the history and mission of apexart, as well as the changes they have seen, and what they are thinking about for its future. 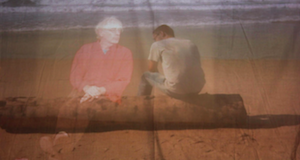 This screening of At Home in Gaza and London and Growing Up in the Dark in Gaza, and discussion will explore landscapes of occupation and creativity under siege. Light in Wartime explores photography’s conversation with objective truth, raising questions about the reliability of seemingly objective historical accounts, such as media images, that greatly determine how war is communicated and remembered. In Regarding the Pain of Others, Susan Sontag writes that “a photograph cannot be simply a transparency of something that happened. It is always the image that someone chose; to photograph is to frame, and to frame is to exclude.”1 Part of the real is always excluded in representation. What we see is not necessarily convergent with truth. Judith Butler concedes that “to call the frame into question is to show that the frame never quite contained the scene it was meant to limn, that something was already outside, which made the very sense of the inside possible, recognizable.”2 Echoing this sentiment, the photographers in Light in Wartime challenge the conventions and limitations of war photography by offering new ways to think about, look at, and represent conflict. Through experimental methods akin to the photographic process itself, they reflect on alternative ways of representing endless violence, motivating viewers to seek answers to questions that arise from the real and the imaginary spaces of representation. Jo Ractliffe’s black and white photographs from the series As Terras do Fim do Mundo present hauntingly serene and barren landscapes that hint at Angola’s violent past and the ghostly aftermath of war. In this series she travels the routes of the War of the Frontier alongside ex-soldiers of the South African Defense Forces on their first return to the area since the war’s end. Ractliffe is interested in how histories of colonial violence, the Cold War, apartheid, and dispossession intersect, and how they impact the present life of such places. The images reflect the desolation, emptiness, and subtle traces of re-growth into the vast Angolan countryside. The voids depicted in Ractliffe’s photographs are interrupted by a presence that is sometimes evident, like a physical trace of war that is being reclaimed by nature. Other times, the void is weighted by the photographer’s psychological presence, opening up a space for contemplation and meditation. It's the correlation of enchanting scenery, of haunting beauty, and unsettling violence, that stirs viewers to reflect on the ways in which documentary photography operates, and question the conventions of mass-media narratives. 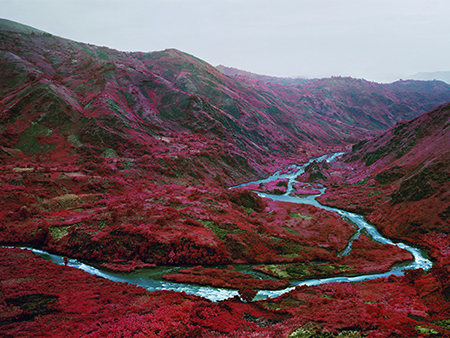 Like Ractliffe, Richard Mosse’s images give viewers space to meditate on the sites and implications of conflict without numbing them to the gruesome horrors and bloodshed of war. To represent the conflict in the Democratic Republic of the Congo, he uses Kodak Aerochrome, a discontinued reconnaissance infrared film that was developed during the Cold War to reveal an enemy’s location by reading the landscape’s heat. Mosse depicts a rich topography that is inscribed with traces of conflicting interests and inhabited by rebel groups at war with the Congolese national army. Infrared mediates a world unseen by the human eye, and metaphorically makes an unseen conflict visible. Unlike Ractliffe’s ghostly monochromatic landscapes, Mosse’s landscapes are bursting with electric shades of crimson and bubble gum pink, on the verge of becoming surreal wonderlands. 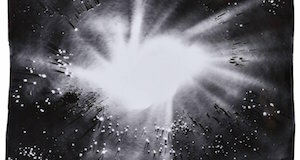 By representing the conflict with an invisible spectrum of infrared light, he dismisses the possibility of objective representation by bringing to the fore the artifice of the photographic surface. An-My Lê creates images that transcend specific content and bring to focus the nature of war and theater, as well as the limitations of war photography. 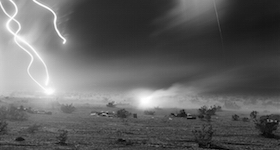 Her series 29 Palms depicts military reenactments in the desert base near Palm Springs, California, where U.S. Marines train before deployment to the deserts of Iraq and Afghanistan. The Mojave Desert is built up like a Hollywood film set, designed to mimic the terrain of Baghdad, Fallujah, or the Afghan valleys. On the base, the Marines both rehearse and play-act their own roles and the roles of their enemies. Lê’s photographs, made with a large format camera, frame a tension between the natural landscape and its violent transformation into a battlefield. The landscape becomes a stage where war is psychologically anticipated, processed, and play-acted. Her photographs mirror the media’s sanitized view of the Iraq war, presenting no gore or bloodshed. Lê’s work prompts us to reconsider the fictions that obscure the ways in which war is experienced, remembered, and communicated. Reacting to the same war and its fabricated rendering in the media, David Levinthal depicts contemporary news imagery of the Iraq and Afghanistan wars through the playful use of toy soldiers in desert fatigues toting machine guns, figurines of civilians, and miniature armored humvees seen at close range in sandswept battlefields. Seen in soft focus through the eerie green glow of night-vision cameras, these convincing facsimiles of real war scenes add to the discussion about war, and its broadcast in real time to an outside audience. By shifting the focus away from the soldiers and onto the language of presentation (the green lighting, the soft focus, the street-level views), Levinthal communicates a scene much like war photography, that tells us what we’re looking at. Levinthal’s I.E.D series examines the way in which society looks at war by using a visual vocabulary of what war looks like to question our unquestioned assumptions. Delving into the lived experience of war and conflict, Rula Halawani, a native of occupied East Jerusalem, employs one apparatus of war as a tool in the making of her photographs. Her series The Bride is Beautiful, But She is Married to Another Man was shot while crossing through militarized Israeli checkpoints. When processed, her film appears ghostly, distorted, and over-exposed due to the damaging effects of the X-rays. Halawani’s photographs challenge the neutralized reception of documentary photography that tends to homogenize conflicts, by turning the language of occupation upon itself. Seba Kurtis approaches his work from a lived and experienced perspective as an illegal immigrant in the UK. His photographs depict the desired invisibility of immigrants undertaking border crossings vis-à-vis the mechanisms used by the state to detect their presence, such as heartbeat detectors. Portraits of migrants in detention centers undergo colorimetric manipulations to mimic the systems used at the frontiers to detect human presence. Kurtis’s work hovers close to fiction and his stance is aesthetic, not documentary. Using the light streaming in from a small hole in a basement of an abandoned factory in Aleppo, Sebastiano Tomada Piccolomini creates haunting portraits of sheltering Syrian rebels holding what they deem as the most essential and crucial object. Working in the midst of warfare and shelling, Piccolomini uses high-contrast side lighting to create stylized portraits in which only the faces and objects are visible against blackness, mirroring the bleakness of life during wartime. When wars end, how does one reckon with their aftermaths? Using the sniper hole of a notorious landmark from the Lebanese Civil War, the Barakat building, also known as the Yellow House, Nilu Izadi recalls Beirut’s harrowing past. Izadi converts one of the Barakat’s rooms, known as the sniper’s nest, into a hauntingly beautiful camera obscura installation. The Barakat building, now a museum dedicated to the war in Beirut, was once positioned exactly on the demarcation line that divided East and West Beirut. Due to its strategic location, it was occupied by Christian militiamen who reappropriated the interior spaces to serve their military purposes. Inverted modern skyscrapers, oblivious passersby, and blue tinted skies move silently across war-ravaged walls. As much as war is about killing, it’s also about destroying forensic evidence, cultural heritage, and collective memory. In Quest for Identity, Ziyah Gafic sets out to build a virtual inventory of the everyday personal belongings recovered from the mass graves of Bosnians who were massacred by the Serbian Army during the Balkan Wars. Gafic photographs the items on the same forensic tables used to assemble bodies that are dug up from mass graves. He creates a living archive of the identities of those lost through their material remains, the items that the victims carried with them before perishing into oblivion. Photography is used here for the purpose of forensic evidence, which threads together various counter-narratives, identities, and histories. Vartan Avakian’s work Suspended Silver proposes a new understanding of memory as a physical trace composed of material ciphers waiting to be decoded and reinscribed. In this series, silver particles—recovered from an abandoned photo studio once located in the aforementioned Barakat building—become a material trace, an artifact of a photograph, as much as they symbolize the expiry of the photographic content. The light-sensitive particles of film debris that once revealed memories, become inscriptions in their own right and are composed into clusters that make up individual photographs. The work proposes the act of memorial- or monument-making, as an act of representing the space of remains. Monumentality, in that sense, exists not in scale of the structure, but in the historical and material weight that has accumulated and settled over time. 1. Susan Sontag, Regarding the Pain of Others (New York: Picador, 2003), 33. 2. Judith Butler, Frames of War: When Is Life Grievable? (New York: Verso, 2009), 9. Special thanks to Christophe Guye Galerie; Jack Shainman Gallery, New York; and Talwar Gallery | New York/New Delhi. Rola Khayyat is a Lebanese visual artist and curator. In 2016 she graduated with an MFA in photography from Columbia University. Her work explores new dimensions on the representation of war, memory, and identity. Rola has curated shows in Beirut, Thessaloniki, and New York, such as the BEYroute for the third Thessaloniki Bienniale, Lattice Work at the Black and White gallery, and Simmer at Kunstraum LLC. Her work has been exhibited extensively both nationally and internationally, including exhibitions at the Macedonian Museum of Contemporary Art, Okk / raum 29, Catalyst Arts Belfast Photo Festival 2013, and the 21st International Istanbul Art Fair (Tuyap). Rola lives and works in NYC.